Marshall is a top of the standard, striking fawn boy. He has a strong head, wonderful topline, is balanced front and rear, has outstanding movement and is extremely sound. His hips are R01/L01=02 and elbows 0/1; Penn Hip L0.32/R0.26. Marshall also has an outgoing, goofy, fun loving personality which he displays around people he knows well. He is very much a mixture of his classy and graceful mother, Akylah Vavara (Suvi), and his RUBISS and multi class in specialty show winning father, Aust. CH Treebrook Mountain Ash (Connor). 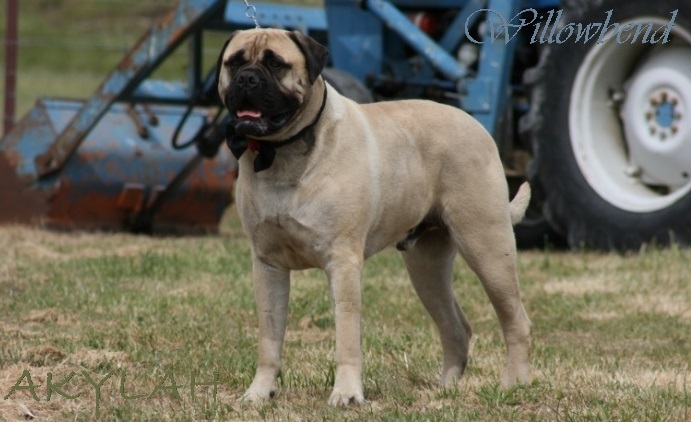 Marshall was awarded Dominion Bullmastiff Club Puppy Of The Year for 2008-2009, with only very limited showing in his first year. Marshall has also had his eyes ophthalmologist cleared. Please see below for more pictures of Marshall.